When we were on a very strict diet a few years back, I'd rotate maybe 4 different menus so that we didn't get bored. We ate 4-5 time a day, very small meals, just to keep the blood sugar even and not get hungry... it worked! have done this was that I was DH personal chef and monitored his food intake. He only ate what I gave him and I kept a food/exercise journal. do you still have those menus hanging around? - I seriously need to lose 40 lbs. and then come and be my persoanl chef? I was trying not to eat before I went to sleep this morning, so I figured I would just eat a piece of a Cadbury fruit and nut bar and a big glass of milk. Funny how those Cadbury bars come in 1 piece. I try very hard to not eat when I get home from work and have another shift coming up. Some days it's just too hard. I had two pieces of Sea Salt Dark Chocolate covered Caramels. No apologies necessary...chocolate, especially dark chocolate is good for you. That looks delicious! Is it egg on a pancake? My second fav, especially if they're artisanal, HUGE Caramels!! 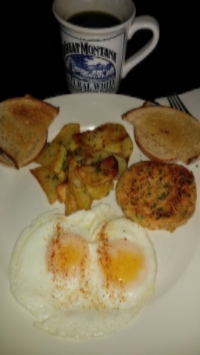 Potatoes (Cajun Seasoned) rye toast, eggs and trout fishcake. Chex cereal with 8-12almonds (yes, i count because they aren't cheap when consumed daily), with soymilk and a scoop of vegan protein powder. But today (probably because I had it before bed and had a stomach ache too), well I ate it, but I wasn't excited about it at first. (see above) although,...I only did have just a piece/bite...but that's because I had a Snickers before that! And the similarities between us continue to grow. When I was at sea while in the U.S. big-Grey-Canoe Club, floating around on aircraft launching canoes, DW would send me a care package containing my, at the time, four favorite candy bars, along with other goodies. These were Cadbury Fruit and Nut, Caramellow, Cadbury DairyMilk, and Cadbury Dark. They are still among my favorites. I don't eat them for breakfast though, and rarely eat candy now (heavy sigh). Been eating poached eggs with toast and bacon lately, though today was oatmeal.